Installing Plasma5 on an openSUSE Factory KDE 4 installation is quite easy. 2) Install the package ‘plasma5-session’ (this will pull in additional ~150 packages, and remove the KDE 4 Plasma workspace, it’s probably best not to do it from within a running KDE 4 session). 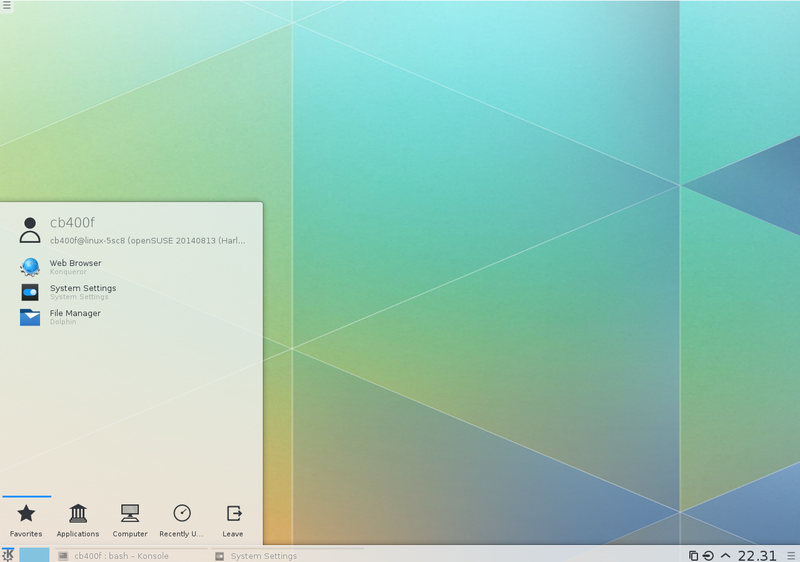 3) Reboot and select to log in to a Plasma 5 session from lightdm. Thanks! I am going to give this a shot. Thanks that worked, the only issue I’ve found is that from the control center I cannot configure my monitors as it says the shared library wasn’t found. I’ve googled and not found anything on it, tried to see if I was missing some obvious pieces in Yast, but not that I can see. Any suggestions? in case anyone else has this issue and runs across this post. I was able to solve my issue. What is needed is kscreen5, for some reason the old version of kscreen was installed and not the latest, I updated to the kscreen5 I was able to find and that resolved my display configuration issues. Nice gecko ambiance! do you have a link?